CARL DEROSE STOOD in his manager’s office, begging for one last chance. It wasn’t that the kid had broken club rules or was being given his release. Heck, this was Carl DeRose, the brightest pitching prospect in the Yankees organization. No, Carl DeRose was begging to start one last ballgame because he had just been told by doctors he would never pitch again. CARL GORDON DEROSE was born in Milaca, Minnesota in 1923. His father John, a truck driver, was an immigrant from Holland and his mother Fannie was a South Dakota girl. Carl was the second youngest of the five DeRose kids, with brother Paul and sisters Elberta, Hazel and Maria rounding out the brood. The family moved to California where Carl became a star baseball and basketball player for Albany High School. Well over 6 foot, the 19 year-old had developed a fearsome fastball that attracted the attention of the New York Yankees in 1942. So impressed was their scout Joe Devine that he gave the kid $5000 to sign – the biggest bonus he’d given out up to that point, and he was the guy who signed Joe DiMaggio. Carl spent the summer of ’42 spinning a stellar 19-6 record with the Amsterdam Rugmakers of the Canadian-American League. His .760 winning percentage and 2.66 ERA made him one of the most promising arms in the Yankees organization and his 204 strikeouts in 227 inning earned him a spread in Life Magazine hailing him as the next Bobby Feller. Then Uncle Sam came calling. Carl entered the U.S. Army in the spring of 1943, where he was assigned to the Air Forces and stationed at McClellan Field outside Sacramento. 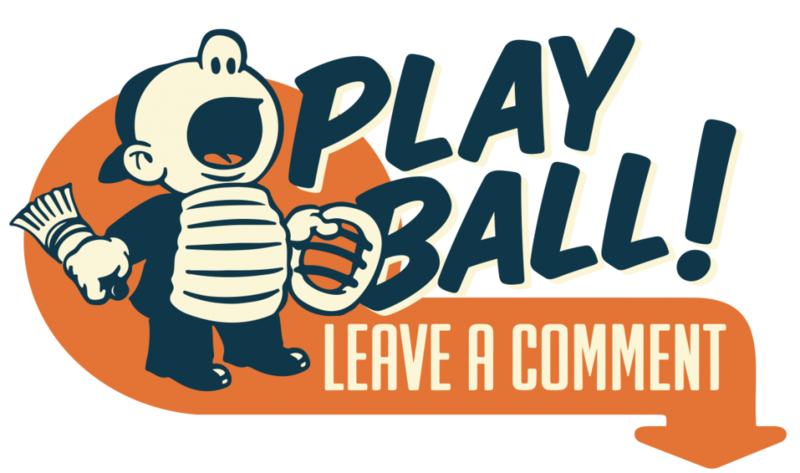 There, Corporal DeRose‘s job was to play baseball alongside big leaguers Mike McCormick, Walt Judnich and Dario Lodigiani, while his teammates Ferris Fain, Bob Dillinger, and Rugger Ardizoia would make The Show after the war. The highlight of DeRose’s military service was his November 23, 1943 complete game win over the Satchel Paige All-Stars. The 20 year-old held future Hall of Famers Paige, Buck Leonard and Cool Papa Bell plus all-stars Newt Allen, Howard Easterling, Booker McDaniel and “Double Duty” Radcliffe to just three hits while fanning 13. Paige pitched the first 3 innings, leaving the game knotted at 1-1, while DeRose went the distance in the 3-1 victory. With the public getting testy about professional athletes being kept stateside and out of action, DeRose was eventually shipped overseas. His first stop was Hawaii where he played with Joe DiMaggio’s 7th Air Force team, and then to Tinian in the Mariana Islands where he continued to play ball with former major leaguers. That spring DeRose had the heady experience of having Joe DiMaggio and Joe Gordon tell him he “can’t miss.” Though his place on the Yanks’ Opening Day roster looked set, DeRose sabotaged his big chance when he broke a knuckle in his pitching hand horsing around with some teammates after an exhibition game on the trip north. He was placed with the team’s top farm club in Kansas City where he went 12-6 with a 3.16 ERA – a record all the more impressive since the Blues finished in next to last in the league, 23 games out of first place. Even with three years lost to the war, Carl DeRose remained as one of the brightest stars in the Yankees’ vast organization. DEROSE RETURNED HOME to California for the winter and took a job working construction. He did heavy labor, mostly shoveling and handling the jackhammer. When he went to spring training with the Yankees in ’47, he found he was too muscle-bound and unable to get loose. The Yankees kept him until they broke camp, but instead of the Bronx, DeRose found he was tabbed for KC again. Though disappointed, DeRose was confident that his arm would loosen up and he’d be toeing the rubber on the mound in the House that Ruth Built before long. Plus he had extra incentive to make the majors – his wife was not only expecting their first child but needed an operation as well. April 12, 1947 was Carl DeRose’s 24th birthday. The Blues were in Denver for an exhibition game against the Bears. The city was cold and snowy that afternoon, and after working half the game, DeRose’s arm began to ache – and it didn’t stop. He tried firing up the old hard one, but the power was gone. He attempted to get by on curves and change ups, but the pain was constant. Back in Kansas City, DeRose subjected himself to a round of doctors. By the end of June the consensus was he had calcium deposits in the shoulder. Verdict: Carl DeRose will never pitch again. The bad news came on June 25. The Yankees acted fast, arranging for their prized prospect to immediately undergo what would most likely be career-ending surgery. But before he went under the knife, Carl DeRose wanted a shot at one last game. He wanted it to be perfect – and it was. BLUES SKIPPER Billy Meyer was a baseball lifer. In 1947 he was 54 years old and had more or less seen it all. That is, until Carl DeRose walked into his office. “What could I do?” he later told sportswriters. “He begged for just one more chance.” Meyer reluctantly gave DeRose the nod to start the next day’s game. As expected, Thursday, July 26 found Carl DeRose’s right shoulder shrouded in pain. That night at the ballpark, DeRose tried to loosen up but found his hard one was still AWOL. All he had left were curves, change ups and guts. Before the game, Meyers gave him the opportunity to bow out, but DeRose told him he was ready. His opponent that night was the Minneapolis Millers. The Millers were the top farm team of the New York Giants, and of the 11 Minneapolis players DeRose would face that night, 5 had previous big league experience and 4 would make The Show in the near future. DEROSE TOOK THE MOUND and retired the first three batters. Though he didn’t have his fastball, he still had great control, and his pitches were hitting all the right spots. The Blues scored a run in their half of the first to get an early lead. Carl set the Millers down again in inning two, but by the time he reached the dugout Billy Meyer knew his pitcher was in trouble. The skipper signaled for Fred Wolff to warm up in the pen. DeRose set the Millers down again in the third, but now Big Carl had tears streaming down his face as he entered the Blues dugout. Meyer told DeRose that he could bow out, but he shook his head no. By the time the 4th inning ended, DeRose’s teammates knew something special was going on. Yet despite the no hitter, Meyer pleaded with DeRose to call it quits. Everyone in the dugout could see the non-stop stream of involuntarily tears that ran down DeRose’s cheeks as he fogged in pitch after painful pitch. Still, DeRose refused to throw in the towel, gritting his teeth and wiping away the tears with the damp sleeve of his sweatshirt. Despite his lack of the hard one, the best the Millers could do was harmlessly swat his slowball offerings at the Blues fielders. DeRose threw only 97 balls the whole game and only once did he run up three balls on a batter – and that was the last one he faced. Unlike today, where managers go out of their way to “help” an opposing pitcher complete a no-hitter and batters refuse to bunt lest they be the one to spoil a no-no, there weren’t any of those “unwritten rules” back in Carl DeRose’s day. Case-in-point: despite being one out away from history, Minneapolis’ manager sent up a pinch hitter. Carl would have to earn his perfecto the hard way. The pinch hitter was Babe Barna, a former big league slugger with the Giants, Red Sox and A’s. Barna ran the count to 3 and 2 when the ump called a sure strike a ball. Now at risk of walking Barna and ruining his perfect game, DeRose bore down. Ken Silvestri, the Blues catcher, got caught up in the moment and told Barna “you better be swinging” and then glared at the ump, hissing, “it better be a strike.” He needn’t have worried, DeRose fired a perfect fastball past Barna for strike three. Carl DeRose performed the most difficult and elusive feat that a pitcher could dream of: the Perfect Game. Twenty-seven batters up and retired, not one reaching first base. Only two balls were hit with any amount of power, each gobbled up by the Blues fielders. Incredibly, DeRose’s masterpiece was the first perfect game recorded in the history of the American Association which dated back to 1902. As a side note, DeRose’s perfecto capped off five straight days in which at least one no-hitter was recorded in one of the 52 minor leagues throughout the United States and Canada. In between games of the Independence Day doubleheader, Carl was presented with a check from the fans and a trophy for his achievement. Then it was off to California where he would consult with more specialists and take care of his ailing pregnant wife. THROUGHOUT the summer, DeRose nursed his shoulder, first resting it, then attempting to work it back into shape. He came back to Kansas City at the end of the season, getting into a couple of games with mixed results. The heater was gone, but his control was still there. He began the next year with KC, then the Yanks sold his contract to Portland in the Pacific Coast League. 1949 found him a further rung down the bush league ladder with Beaumont in Texas and after 5 games in 1950 he ended his pro career. DeRose was offered a paycheck to pitch semi-pro ball for Spencer, Iowa, then moved to Minnesota where he took a job butchering hogs at a Hormel plant. DeRose pitched semi-pro ball for a few more years, capped off by a National Championship in ’52. That brought out the scouts who proffered minor league contracts, but DeRose knew he’d never make the majors. He became a plumber’s apprentice and concentrated on earning his journeyman’s card. Once armed with a solid trade, DeRose moved back to California where he and his wife’s family was based. Carl’s beloved wife passed away in 1980, followed by his daughter three years later, both from cancer. DeRose took disability and retired, his old baseball injuries finally catching up with him. Big Carl spent his retirement fishing and helping to preserve the natural resources of the Bay Area. The old pitcher succumbed to a heart attack on January 2, 1989, leaving behind a large family and one absolutely perfect ballgame. 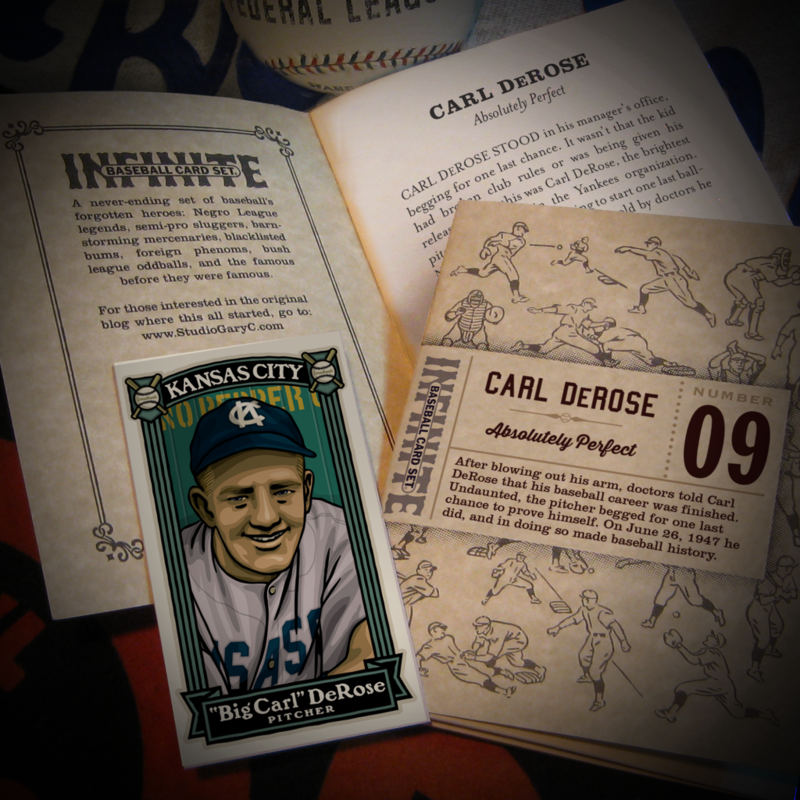 Though most of the material found in this story originated from contemporary newspapers and magazines, Jack Etkin’s chapter on Carl DeRose in his excellent 1987 book Innings Ago: Recollections by Kansas City Ballplayers of their Days in the Game added great insight into the pitcher’s feelings about his great game and once promising career. This week’s story is Number 9 in a series of collectible booklets. Each of the hand-numbered and signed 4 ¼” x 5 1/2″ booklets feature an 8 to 24 page story along with a colored art card attached to the inside back cover. These mini-books can be bought individually, thematically or collected as a never-ending set. In addition to the individual booklets, I envision there being themed sets, such as the series I did on Minor League Home Run Champions. I will also start a Subscription to the series as well. A year subscription includes a guaranteed regular 12 issues at a discounted price, plus at least one extra Subscriber Special Issue. Each subscription will begin with Booklet Number 006 and will be active through July of 2019. Booklets 1-5 can be purchased as a group, too. I loved this. Thanks for sharing. Glad you liked it! It was a pleasure to do – a story as inspirational and unlikely as this almost writes itself. Great article. My late father played with Carl DeRose at Albany High School. They had another pitcher, Roy Pitter, who was also a hot prospect in the Yankees’ system. Pretty good one-two punch on a high school team. (My father and Pitter were both a year ahead of DeRose.) Dad wasn’t real big on reflections, but I did hear a few good stories about his high school baseball days. He once told me that DeRose was the hardest throwing high school pitcher he ever saw. He also mentioned that a Carl DeRose Day was held at a minor league park, but this article told the whole story. Thanks so much! Wonderful piece! My late father actually played with Carl at Albany High School. They had a great one-two punch on the mound, as Roy Pitter was also a hot prospect who signed with the Yanks. (My Dad and Pitter were a year ahead of DeRose.) Dad turned down a Class D contact and played two years at SFJC, and he said he never played with or against anyone who could throw as hard as Carl DeRose. Dad didn’t talk about the past a lot, but I have a distant memory of him briefly mentioning the perfect game and Carl DeRose Day. But this article presents the story as it should be told. I really enjoyed it. Thanks so much. © 2018 Gary Joseph Cieradkowski.